Termites communicate by using their pheromones, each colony of termites have their own scent. 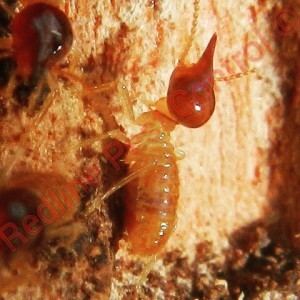 If termites feel threatened they will start tapping away to let other termites know that danger is ahead. Termites are actually very beneficial to the environment as they break through plants and trees and turning it to new soil. Now this may sound gross but termites will actually feed off each other’s faeces. Termite soldiers and workers are blind, only reproductive termites can see as when they become Alates they will fly off in search for a new location to start breeding. Termites are in no way related to ants but are actually related to the cockroach. Termite queens can lay up to 30,000 eggs per day and can live up to 25 years. There is more termites on this earth than humans. Termites never stop to rest and will work day in and day out for the rest of their lives. Termite Alates will usually swarm for around thirty minutes and this is done in the late spring to summer often after a little bit of rain. With the humidity in the air it gives them just enough time to find a new home to start their colony.